We have been discussing about various Google algorithm updates. As you might have guessed, next in the line is Google Hummingbird update. But before diving into Hummingbird, I thought of covering Knowledge Graph in this post since that’s the foundation stone. In a later post, we will dive deeper into Hummingbird and the whole new world of Semantic Search. In the world of PageRank, we have been dealing with unstructured data; i.e search engines were looking for keywords independently and trying to gauge the relevancy of a web page compared to a keyword. We are presently moving to a world of structured data; and thus the world of semantic search. Semantic search tries to gauge the meaning of search queries with the help of microdata, schemas, or RDFs (Resource Definition Frameworks) and more. 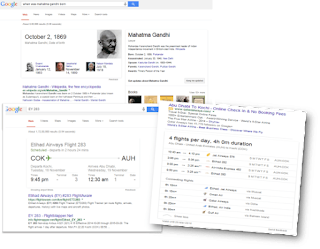 Google Started to move in this direction with the introduction of Knowledge Graph in 2012. 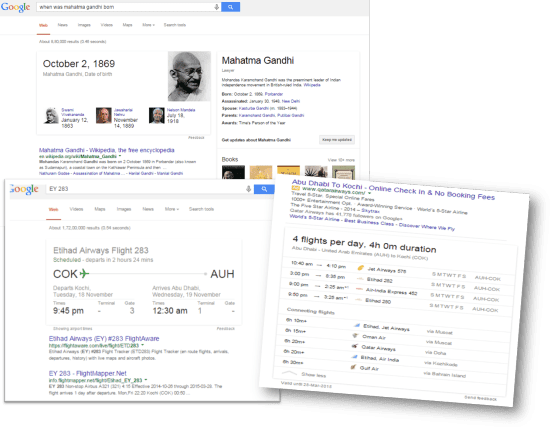 From a layman’s point of view, Google started showing facts in addition to the usual search results for keywords involving famous personalities. From a slightly technical point of view, this was achieved with the help of link graph model that Google incorporated in its algorithm. Let’s fast forward to November 2014 and see where Knowledge Graph is today. Let’s start with an example search for ‘baba amte’ results in a knowledge carousel in the right and pulls information from Wikipedia (or other credible sources) along with the usual search results. If we dig a little more, and click ‘more’ in the Awards section; it takes you to another search result; this time for ‘baba amte awards’. 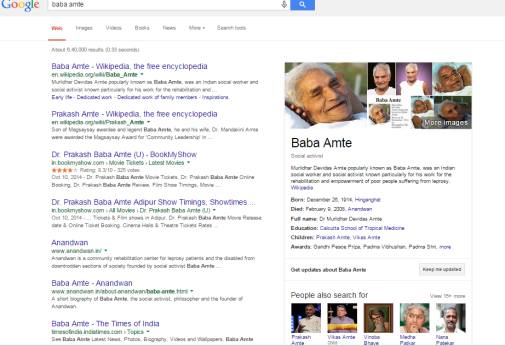 It gives the details of awards, Baba Amte received in the search result itself as below. Essentially search engine are moving in the path of not making searchers surf various web pages from SERPs; instead provide all information in SERP itself (or at least the basic facts)! Google is able to provide the information at this level because of the crawl and grouping of information in the web into meaningful entities – like let’s say social workers, politicians, actors and so on; The interesting part is not only are the entities considered; but also relationships between them – For example, actor-award-films-personal. We will discuss about entities in detail in a future post. 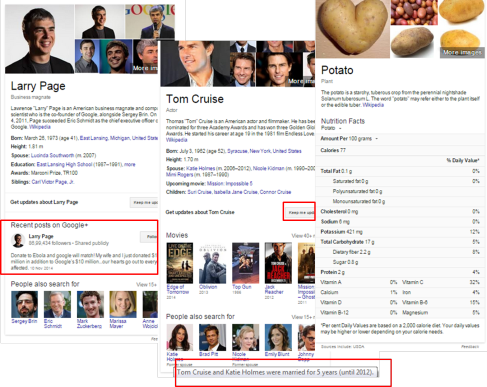 Relationship information provided in the ‘People also search for’ section. If you search for an actor; the knowledge panel shows a hover assist with information on how the searched actor and other ‘also searched for’ persons are related. Provision of social media profile links. If the person (entity) you searched for is active in social media platforms; a link to those are provided in the knowledge panel. Nutrition and other information in food categories. For example – consider ‘potato’. It provides nutrition information and what not! The option varies depending on queries. In the News section. For relevant search queries, results based on news articles are provided separately. Now let’s focus our attention on top section of the SERPs. Consider the search query ‘Thailand tourism’. The search results provide a set of possible tourist places along with links and photos. If you click on a particular place, the search results will automatically be changed to the associated place! 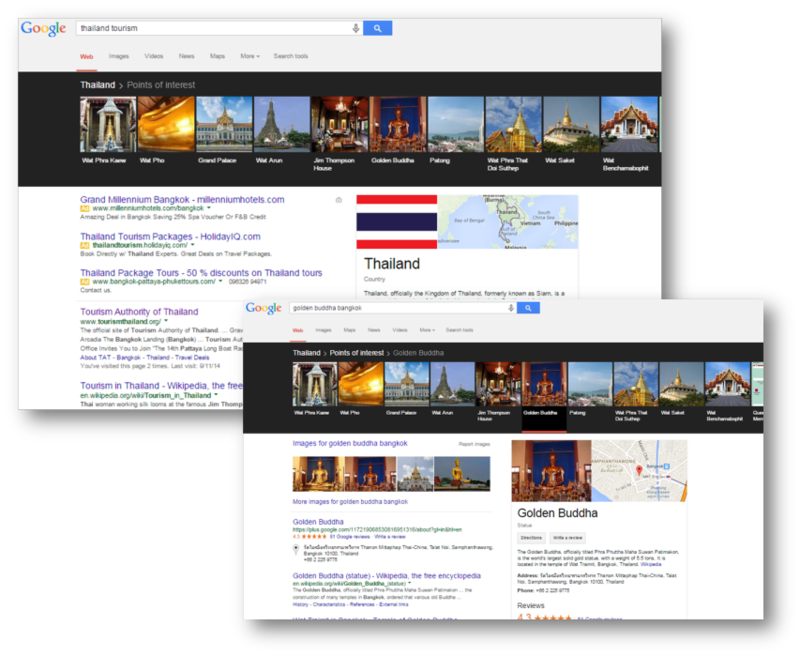 A similar carousel will be shown for queries like ‘things to do in thailand’ or ‘places to visit in Bangkok’ and so on. Now consider another example of search query – ‘when is mahatma gandhi born’. It gives the date of birth and in addition, provides the birth dates of related persons!. Now consider an example of flight number – EY283. Or ‘Abu Dhabi to Kochi’. Some other example include answers like time information, simple calculations, temperature and more. As you can see the search engine is trying to move in the direction of becoming an answer engine instead of just search engine! Isn’t the world of semantic search exciting…. ?